Thomas Griffin was born in Cork in the last year of the Twentieth Century. April 1899 to be exact. He came from a small family, only him and his Sister Mary, who was born in New York, according to the 1911 Cork Census. His Father Denis was a Soldier in the Army, and Thomas like most young men then, wanted to Follow in his Father's footsteps. So in 1916 as soon as he turned 17yrs he signed up to the Army. He saw military service as N.C.O., I/C Engineers, 'C' Coy, 2nd Battalion, 1st Cork Brigade. 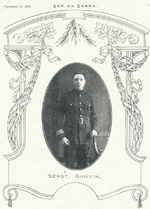 He was Promoted to Sergeant on the 16th Oct 1922.